Today’s global agriculture faces a myriad of problems that range from desertification and loss of fertil soil to over-fertilisation. These pose a significant risk to biodiversity and food security. 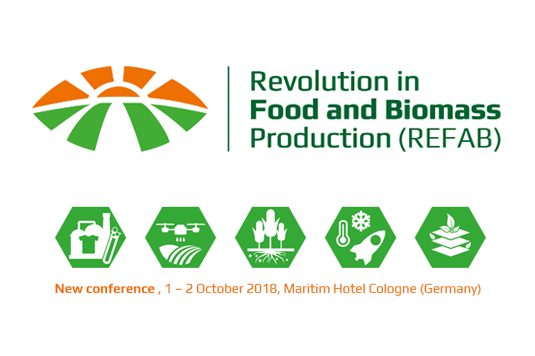 REFAB brings together experts from research and industry to collaborate for cutting-edge solutions to these problems and enable a high-tech revolution in the production of food, feed, and biomass. Revolution is a strong term, but it might just be the right word for what is going on in food and biomass production. In nine areas, major upheavals and innovations are taking place, largely independently of each other. Taken together, they represent a transformation that brings our entire food and biomass production to a whole new level, becoming more efficient, sustainable, healthier and more in harmony with nature. During the conference, nine innovation pillars of the sustainability revolution in food and biomass production will be tackled. Precision farming will take us into a future where further digitalisation enables artificial intelligence (AI), robots and drones, to make modern agriculture more efficient and sustainable. We will see how biostimulants complement crop nutrition and crop protection, and how Urban and Vertical Farming leads to sustainable and local food sourcing in highly populated areas. As climate change progresses agriculture under extreme conditions will become more and more relevant, including the need for improved plant varieties. Further pillars include the search for alternative protein sources, enabling organic and smallholder farming. At the conference, there will also be a focus on the oceans, as mariculture and marine farming take centre stage. Last, but not least, biorefineries and biotechnology are an important part of the Revolution in Food and Biomass Production. The CSCP supports this unique conference and we are inviting you to join us there to participate in the food and biomass production revolution. The event is in English, registration is required and participation fees apply. Please visit the REFAB Website for further information on the programme and registration procedures. Please contact Jana Brauer if you have further questions.